Baseball kicked off its season Feb. 15-17 at the Brittain Resorts Invitational in Conway, South Carolina. The Rams played Coastal Carolina, Campbell and Maryland, losing to the Chanticleers and Terrapins in close games. Maryland edged the Rams 5-3 as the Terrapins rallied to score two runs in the sixth inning Feb. 17. Sophomore right-handed pitcher Justin Sorokowski started for the Black and Gold and lasted three innings, giving up two runs but striking out four. Senior infielder Zac Ching, junior outfielder Alex Taylor and junior catcher Josh Simon all scored runs. Sophomore right-handed pitcher and outfielder Jack Schroeder scored a run in the first inning after he was hit by a pitch. Maryland answered with a run in the top of the third, but the Rams rallied back in the latter half of the fourth with two runs. Simon scored on a wild pitch, while Taylor scored on a throwing error from a pickoff attempt. The Terrapins rebounded with two runs of their own in the top of the sixth, tacking on another run in the top of the eighth to take a two-run lead. Maryland held on to that lead, winning 5-3. The Rams edged out an 8-7 victory over the Camels Feb. 16, scoring five runs in the sixth to tally a win while eight players racked up hits. 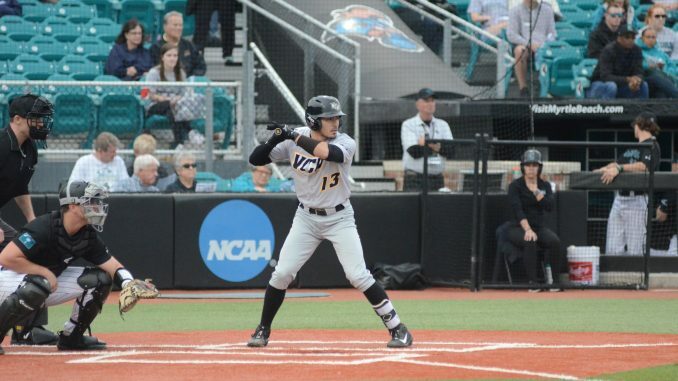 Junior infielder Paul Witt put VCU on the board in the first inning, lining a single into center that allowed sophomore utility player Hogan Brown to score. Campbell answered right back, doubling that number and scoring two in the bottom of the opening frame. A Campbell solo shot to left extended that advantage, but VCU loaded the bases in the top of the fourth to threaten that lead. With the bases loaded, Taylor singled into left, driving in Schroeder to cut the deficit to one. Freshman right-handed pitcher Evan Chenier struck out three during his time on the mound in relief, putting up two scoreless innings. Schroeder then singled in the fifth, driving in junior infielder Brett Norwood and tying the game. After the Camels racked up three runs in the bottom of the inning, the Black and Gold answered with a five-run sixth inning. Ching, Brown and sophomore catcher Hunter Vay all crossed the plate on the Rams’ hits, while Witt and Taylor used Campbell’s two errors to score. Campbell attempted to rally in the ninth, but a Rams double play put a stop to the threat before the Camels could gain momentum. The Rams fell to No. 12 Coastal Carolina in the season opener 10-8 Feb. 15. VCU took the lead early, but the Chanticleers came back to edge the Rams. The Rams took an early lead with a three-run burst in the top of the second inning as Brown scored Simon. Ching doubled to center to score Brown and Taylor, putting the Black and Gold up 3-0. But Coastal Carolina countered with two runs in the bottom of the second, after Parker Chavers launched a two-run blast over the fence. VCU extended its lead to 5-2 in the top of the fourth. Witt and junior outfielder Brandon Henson smacked singles to drive in Ching and Norwood. Coastal Carolina closed by a run in the bottom of the inning, bringing the Chanticleers within two. The Chanticleers rebounded in the bottom of the sixth with a five-run frame, giving them an 8-5 advantage. The Rams tried to answer with a home run by Henson in the top of the seventh, but the team’s first hit over the fence only brought them one run closer. Zach Biermann then hit a two-run shot in the eighth to extend Coastal Carolina’s lead to four. 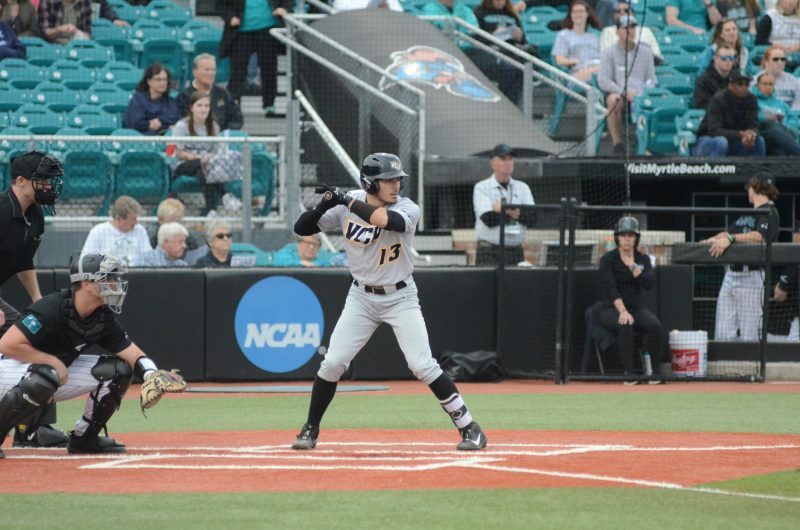 VCU tried to rally in the top of the ninth, scoring two but leaving a runner on base and falling short of tying. Brown went 4-for-6 with two runs batted in and a run scored, while Witt and Ching combined for four hits and 3 RBIs. The bullpen, comprised of junior right-handed pitcher Connor Gillispie and senior right-handed pitchers Benjamin Dum and Curtis Bafus, struck out 13 in relief. The Rams are on the road Feb. 20 at North Carolina, with first pitch at 3 p.m.